terminology and basic info. Should you have any further questions, seek the guidance of your Sensei. the proper respect to it, and their teacher while on the mat. bowing with a class, for an exercise, in a greeting or for kata, eyes are cast downward. you can never assume you know what is about to happen. to make sure that you have your finger and toe nails clipped short so you do not scratch your partners. a white t-shirt under your uniform. Always tie your belt facing away from the front of the dojo, or facing away from your sensei. native Okinawan martial art at the time, simply called Te (“Hand”), to make what we now know as Karate. Kingdom, until the 1800’s when Japan made it officially part of the nation. · FACT – The capitol of Okinawa is Naha city. strength, and of course confidence. 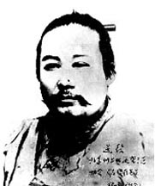 like our founder Kanbun, also went to China, learned a system of Chinese boxing, and taught it to his people. His style of Karate is called Shotokan, and is one of the main systems of Karate today. that the pronunciation changed to Karate, and the meaning changed to Empty Hand. is still flexible. This is a defining characteristic of Uechi-Ryu, something it still stands for today. fist. Pangainoon is believed to be a combination of these styles. senior ranking student eventually drove him to leave by making fun of him for having a speech impediment. Soon after, he met Shushiwa. which, Kanbun was accepted into Shushiwa’s school in a secret ceremony called Pai Soo. from, then Pangainoon-Ryu, to Uechi-Ryu in his honor, as well as naming Kanbun as grandmaster. for self defense lies in Sanchin kata. tiger, we find strength, ferocity, and determination. From the dragon, we find speed, flexibility, and breathing. known as the crane beak strike, and the Hiraken Fist is also known as the tiger paw. Tomoyose would study Karate under Kanbun’s son Kanei. men are some of the leading authorities on Uechi-Ryu today. · Dojo - Name for the training hall one studies in, literally means "Way place"
· Geri – Kick - when paired with a directional, i.e. Shomen Geri (Front Kick), Yoko Geri (Side Kick). · Karate-Ka - A dedicated karate practitioner or student, one who is committed to practicing. literally meaning “half hard and half soft”. meaning "glare in the eyes with fast hands". by Saburo Uehara, two senior black belt students of Kanei at the time. referred to as Dani Seisan, meaning "little Seisan"
Bunkai - application or study of a kata. Yakusoku-Kumite - prearranged sets of attacks and defense preformed by two partners. Kyu-Kumite - beginner partner sparring, consisting of five sets of prearranged attacks and defense. Dan-Kumite, - advanced partner sparring, consisting of six sets of exchanges. that we are all students in one way or another. achieve, so motivation is increased. Japanese, so it was changed to avoid it being known as a "Death Rank". what you've added to the Uechi community. the order they would be issued in is as follows. accomplished this, as well as learning to speak Chinese. 1904 - After seven years of study, Kanbun earns his certificate to teach Kempo. May 1910 - Kanbun marries Gozei Toyama. June 26, 1911 - Kanei Uechi, Kanbun’s eldest son, is born. demonstrated his Karate before travelling to Japan. him to teach his Karate. This is the first time Pangainoon is taught outside of China. 1927 - Kanei begins his studies at the Shataku Dojo. Okinawan community, and teaches Pangainoon-Ryu. 1937 - Kanei Uechi earns his certificate to teach Kempo, and would open his first school. 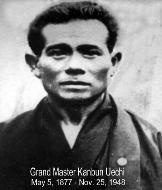 1940 - Pangainoon officially renamed to Uechi-Ryu, and Kanbun at age 63 is named Grandmaster of the style. teaching Uechi-Ryu in Nago, Okinawa. This is the first time Uechi-Ryu is taught in Okinawa. 1948 - November 25th of this year, Kanbun Uechi dies of Nephritis, or inflation of the kidneys. 1956 - George Mattson begins his study of Uechi-Ryu under Ryuko Tomoyose sensei. is the first time Uechi-Ryu is taught in America. Feb 24, 1991 - Master Kanei Uechi dies. his teaching until earning Nidan. time she would promote to Sandan. 2005 – March 1st, Sensei Wendi Barker opens Tiger Martial Arts on Whidbey Island, Washington. 2006 - Sensei Wendi Barker begins study under Fedele Cacia Sensei, who is her current sensei to this date.